We may collect personal identification information from Users in a variety of ways, including, but not limited to, when Users visit our site, register on the site, subscribe to the newsletter, fill out a form, and in connection with other activities, services, features or resources we make available on our Site. We may ask for users’ name, gender, job title, telephone number, email address, demographic information such as post code, preferences and interest. Users may, however, visit our Site anonymously. We may obtain personal identification information from Users only if they voluntarily submit such information to us. The information could be about the usage of our Website to help us develop and improve it further through online surveys and other requests. We only collect personal information through the Services from a child under 13 where that student’s school, and/or teacher, and/or parent has agreed to obtain parental consent for that child to use the Services and disclose personal information to us, for the use and benefit of the learning environment. If user is a student that the school or teacher have generated an account for, please do not send any personal information about yourself to us if your school, and/or teacher has not obtained this prior consent from your parent or guardian, and please do not send any personal information other than what we request from you in connection with the Services. If we learn we have collected personal information from a student without parental consent being obtained by his or her school, district, and/or teacher, or if we learn a student has provided us personal information beyond what we request from him or her, we will delete that information as quickly as possible. If you believe that a student may have provided us personal information in violation of this paragraph, please contact us at info@classter.com. If user is a student registrant and his/her parent or guardian has signed up for the Services with an Access Code provided by the teacher or the school, should understand that the parent or guardian can view all information within or associated with user’s Services account, including, without limitation, messages between user and the teacher and grades user received on assignments. In assessing user’s request for goods or services, we may use his/her information for the purposes of the prevention and detection of fraud. 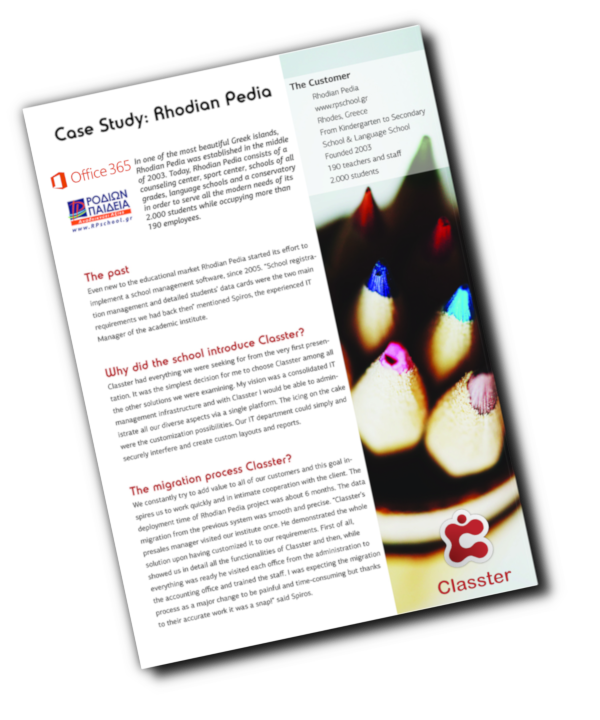 This document sets out the obligations of Classter with regard to data protection and the rights of people under the Data Protection Act 1998 (the "Act"). We comply with the standards, procedures and requirements laid down in the Act to ensure that the personal information user gives us is kept secure and processed fairly and lawfully. What information do we shares with others? We may contract with other companies to provide certain services, including name verification, email distribution, market research and promotions management. We provide these companies with only the information they need to perform their services and work closely with them to ensure that users’ privacy is respected and protected. These companies are prohibited by contract from using this information for their own marketing purposes or from sharing this information with anyone other than Classter. We will not pass users’ information on to any other company or other third parties for marketing purposes unless users’ have agreed for us to do so. One of the purposes for which we may disclose users’ address and zip code details is to check against the IMRG Security Alert or any other Fraud Prevention Scheme. We may also disclose specific information upon governmental request, in response to a court order, or when required by law to do so. We may also share information with companies assisting in fraud protection or investigation. We do not provide information to these agencies or companies for marketing or commercial purposes. The Company currently requires a fee of €10 (the statutory maximum) with all SARs.